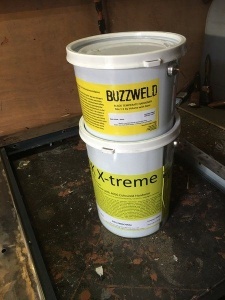 2k Armour is an extreme two pack epoxy corrosion stabilising all in one coating. 2k Armour has many unique attributes from its hardness approaching that of steel at 77% that of mild steel, to stabilising corrosion, and its extreme abrasion resistance, and build. Superb for heavily keyed substrates such as pitted chassis, T-washed rough Galv, and blasted axles, 2K armour will stand up to most levels of abuse and is used in the challenge scene to great effect. We supply you a 2.5 liftre and a half filled 5 litre tub. the mix is 1:1 by volume, so 100ml base: 100ML hardener. You will need to use a proper mixing tool at LOW rpm, and we recommend you mix up in small batches. Typically we say mix up 30% LESS than you think you need. This seems to work well with peoples perceptions of how much they need to cover an area. Highly resistant to almost all chemicals, such as petrol, diesel, brake fluids etc, and perfect for fuel tank repair. Other uses include fibreglassing. Direct to a rough surface such as T-washed Galv, corrosion, steel, wood. Compatible with most coatings due to very low solvent content. Extreme build and abrasion resistance make this suitable for extreme environments, and longevity of protection. Has extremely good opacity. It is therefore very easy to not put enough on as the substrate appears "protected". Mildly contamination intolerant. Requires good prep to be effective. Anywhere exposed to UV such as a bumper as it will affect the colour. Will not cause product failure in normal use, but will dull. Remove all Loose paint, wax, and underseal using a paint remover. If any wax/underseal/wet wax was used previously it must be THOROUGHLY removed with a solvent degreaser. Clean down the surface using clean water and a Scotchbrite type scourer before drying. There is no requirement to remove all rust. You are looking ideally for a clean, dull surface, providing the coating something to adhere to. If applying to medium to heavier corrosion manual application by wetting out brush should be used. Precaution should be taken that on heavier corrosion CIO is not applied in a warm breezy environment as it will cure too fast and not wet out correctly. Apply the coating in a vigorous manner, working the coating in to the substrate. Air bubbles are likely to raise to the surface as the product is agitated and continues to wet out. Best prep is direct to the base metal, but can overcoat most other coatings. Test patches if unsure. pot life once mixed is up to 75 minutes. Stir and agitate the product thoroughly prior to use using an agitator. The product will go black right through when mixed, with no patches or swirls of brown. The product can be brushed, rollered or sprayed. Using a seam sealing, or turkshead brush, work the first coat in to the substrate/ metal you are looking to protect. This has the added benefit of greatly increasing the ability of the product to wet out benefiting the application in several ways. After you have applied your first coat, allow it to cure for 2>3 hours minutes typically. You must apply the second coat before it sets fully, otherwise you will have to re-key the coating prior to top coating. Apply your second coat using a large softer brush so as not to damage the first coat. Brush finish depends alot on brush used and technique. Cheap stiff brushes will leave a very lumpy finish. We recommend you use a long handled narrow roller for application. This gives you a higher pressure of application for the roller, assisting wetting out properties, and gives you better access and control. Apply the first coat using reasonable force and a slow pass with the roller. Repeat the rollering process in the same area several times if existing corrosion is present to assist wetting out and adhesion later on. Do not spread the product out so far that you reduce the amount of coating, and thus reduce the protection available. Allow coating to cure semi-hard for a few hours depending on conditions, prior to adding a second or third coat. Ensure coating is hard dry through prior to use. 2 coats for a prepared base, or light corrosion, 3 coats medium corrosion. Buzzweld 1.8MM Suction Feed gun. Thin 2k armour using 2k armour thinners up to 20%. Using a 400 Micron strainer load the gun with product, and set the pressure between 60- and 70 psi. Thin the MINIMUM so you can use less coats and save time. Spray as per normal spraying instructions, building up the product. We would suggest you allow the product to cure for a few hours, and then apply a minimum of a second coat. Three would be ideal, but time or requirement may not permit this. 3 coats medium corrosion. 4 for heavier corrosion. (2 can be used if not thinning too much, and corrosion isn't too heavy. you will need to use heavier coats, and adjust your cure and overcoating times accordingly). 2k Armour is unlikely to react with any products as it contains virtually no solvent. Ensure that any existing product to be top coated with 2k armour is FULLY cured prior to top coating. There is a big difference between hard and fully cured. For example 2 pack acrylics can be hard same day, but take up to two weeks to fully harden so that they can be machine polished. If a coating reacts even after sufficient cure time, contact us for advise, or use a Barcoat Isolator as an intermediary coating. Stabilises corrosion using rust to protect the base metal. Tough, touch dry coating, with phenomenal resistance to abrasion, and an extremely high build. Superb wetting out properties reinforced with extreme resistance to porosity. Ideal as an all in one fast applied solution for chassis and vehicle parts. Can be top coated with most industrial and automotive coatings. semi self etching, so high adhesion to most substrates. Always allow the first coat a suitable cure period prior to second or third coat. Extra pre if the existing coating is a wet waxoil type product, or an underseal. Use fossil fuel heaters in or around coatings when applying or curing. They are not only a fire hazard, but they introduce massive amounts of moisture to the air. Use Cellulose thinners of any kind as prep, or a thinning agent. Use thinners to thin the product that are not 2k armour specific thinners. 2k armour is a specific hybrid coating, and using the incorrect thinners can cause premature failure, delamination, and porosity. Apply to a wet substrate without specific advice from ourselves first. Please be aware cure times can vary wildly. Air movement, film thickness, relative humidity, air flow and temperature all play a large part in the actual cure time of a product. Additionally temperatures below 10C can see the cure times extend exponentially if all conditions above contribute in a negative way.